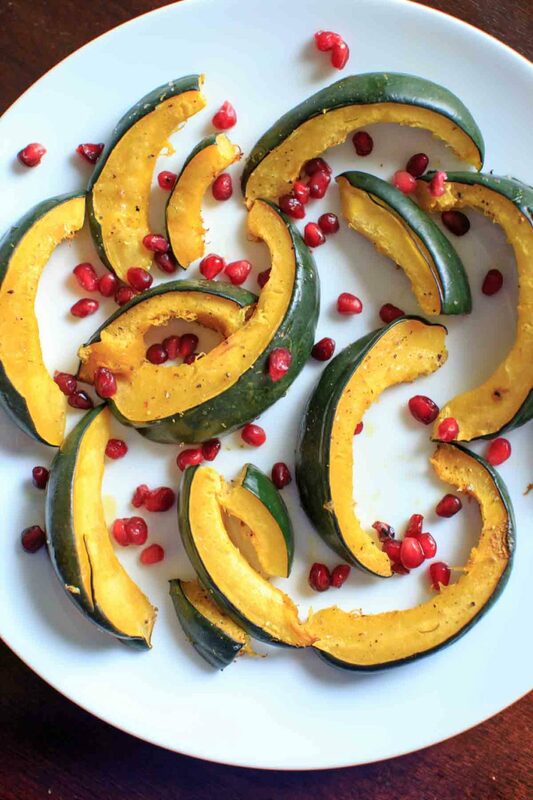 Did you know, acorn squash is sometimes called pepper squash? I don’t know why. I know it’s called acorn squash because it like of looks like a big acorn. It also is an incredibly good source of Vitamin C, fiber, and the antioxidant beta-carotene. These are things you learn when you google a vegetable for something to say. Because really, there’s not much to say about this recipe. It’s acorn squash, roasted. With some pomegranate seeds to liven it up. Slice it up, scoop out the seeds. Drizzle with a little olive oil, salt and pepper to taste, then roast at 400 degrees for 20-25 minutes or until tender. I like to use my cast iron skillet for this but any baking sheet will work. 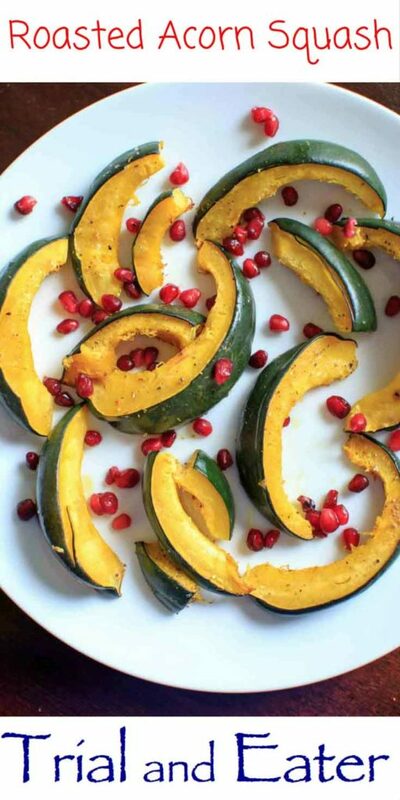 Pretty similar to (or exactly like) the roasted butternut squash recipe. You can just cut it in half instead of slices if you prefer. I just thought the slices were prettier. 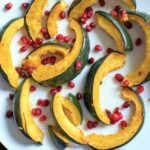 And you can actually eat the skin of acorn squash (and most squashes) if it’s cooked right. A simple vegetable recipe and great for holiday gatherings. 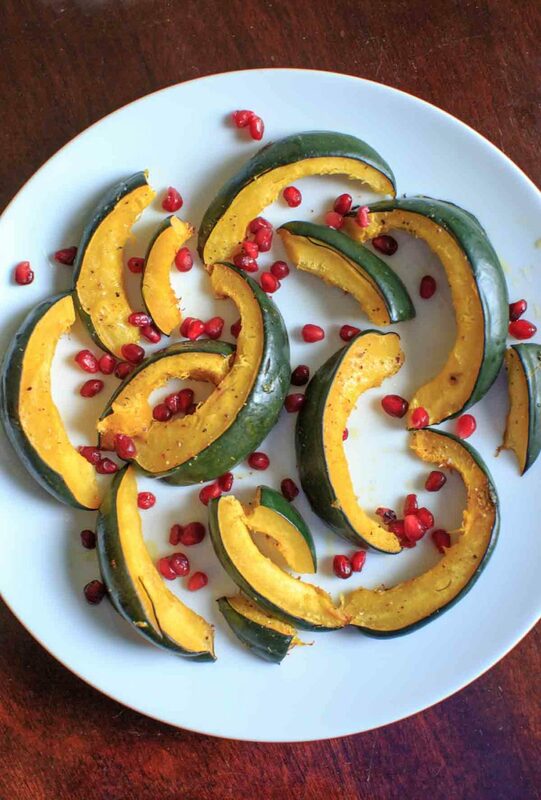 An acorn squash is pretty small but if you do cut it up, 4-6 people could get each get a couple small slices. I like adding the pomegranate seeds (called arils) for a pop of color but they are also incredibly good for you! If you have extra, you can use them in my pear nachos or these cookies. 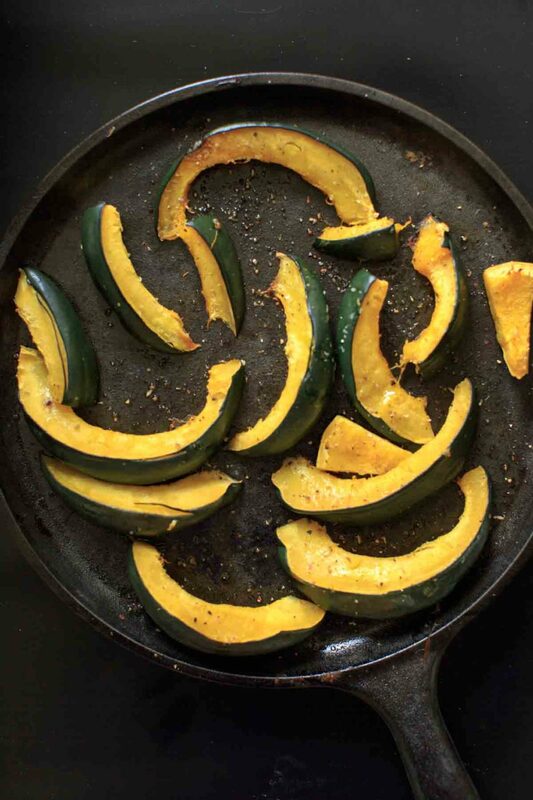 Arrange slices of acorn squash on a baking sheet or cast iron pan. Drizzle with olive oil and sprinkle with salt and pepper. Bake at 400°F for 20-25 minutes or until tender.